Today we made a stop for an early dinner at the Shrimp Shack on our way home from the Kualoa Ranch on the windward side of the island. 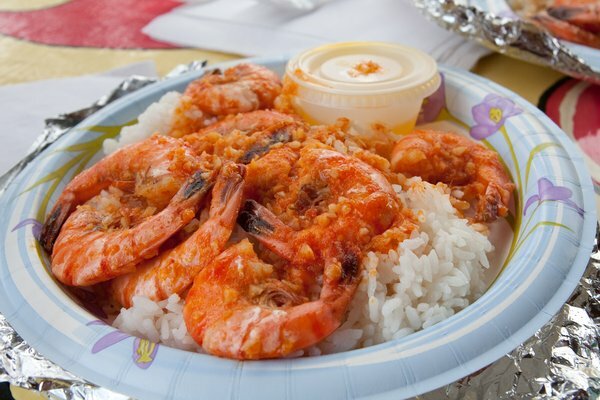 The Shrimp Shack is one of many popular shrimp trucks that specialize in selling local farm raised shrimp cooked up and served plate lunch style. The majority of the shrimp trucks are located at the North Shore, but they can be found almost anywhere since most of them are mobile. The Shrimp Shack has been featured in the Travel Channel's Beach Eats series and won a people's choice award. As you can see the menu is quite extensive and features an array of different foods to satisfy any palate. We had the spicy shrimp and the pan fried garlic shrimp plates. We also tried the guava tropical juice and the 100% Kona Coffee float with a scoop of vanilla ice cream. The shrimp plates and the floats were just OK. There is a huge selection of Shrimp trucks on the island so I guess we are a little spoiled. I will say this about the Shrimp Shack. The service was friendly, it is cheaper/tastier then Giovanni's Shrimp Truck, and the location next to a beautiful beach is an added bonus. Our families' favorite shrimp truck is hands down Big Wave Shrimp in Haleiwa Town, North Shore. We have tried a dozen and they still have the edge in my honest opinion. However, that shouldn't stop your family from stopping by the Shrimp Shack for a snack if you are in the area. Here is the beach across the street where we caught the sunsetting while enjoying our shrimp plates. 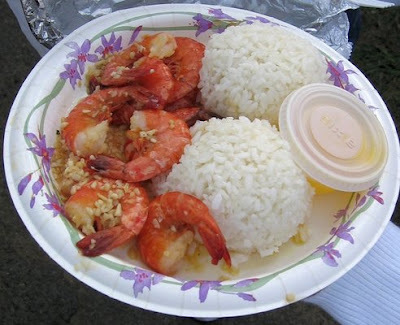 The Shrimp Shack is located at 53-352 Kamehameha Hwy Punaluu, HI 96717. TIP: There are many beach parks on this side of the island off of Kamehameha Highway that are uncrowded and gorgeous. Beaches on the windward side of the island are also great for snorkeling and kayaking.